Myself, I’m a Specialist Games player from way back, getting into the GW hobby with Dark Future and Blood Bowl 2nd Ed back in the late 80s. Despite a brief foray into Warhammer Fantasy Battles around 2004 and joining my son on his exploration of the Mortal Realms through the Age of Sigmar, my GW experience has been through their many side games. With that in mind, I’m going to review the issue as it fits on my table…looking at what the issue offers the side titles, or Specialist Games. 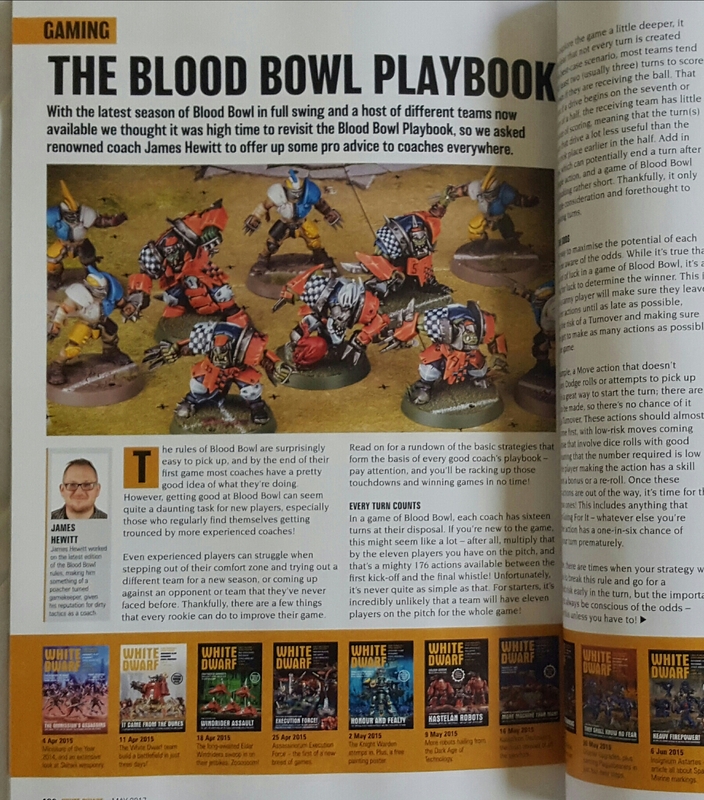 Blood Bowl – We’ll start with everyone’s favorite game of Fantasy Football, and the staff at White Dwarf have given us plenty to take in with several nice articles. First, we’re introduced to some of the secret weapons of legend with a one page fluff piece and a historic play. A nice little read continuing the world building of this new edition. This is followed up by stats and rules for Grombrindal and the Black Gobbo. These are great models. Probably my favorite of the new line outside of the new Griff. Fortunately, they’ve also got some fantastic rules too. The pair have pretty much been designed for fun, league play only showing up on opposite teams as an event of sorts, when a match is made of a side that Grombrindal will play for and their opponent can field the dastardly Black Gobbo. This is a great idea to have the rivals pop up in your league,so they can carry on their grudge without impacting the normal inducement system. There’s a note warning tourney organizers that this pair probably isn’t best for Tournaments, and I agree. No cost is listed for either, as again, their participation is story driven and not General Manager/Coach managed. Finally, there’s a fantastic, all-purpose strategy article by James Hewitt. This is the sort of helpful article I would hand off to a player new to the game. That is, after they have the rules down. Basic Blood Bowl strategies, but important concepts for coaches to grasp such as suggested order of actions, the cage, scoring fast (or slow), etc.There’s a bit of a copy-and-paste typo in one of the cage diagrams, but the correct idea is there. The Hobbit/Lord of the Rings – The adventures in Middle Earth continue this month with a mini game by Jay Clare featuring Legolas squaring up against a War Mumak in a rematch from their Return of the King scene. The rules depart from the standard battle game using unique stats and actions designed specifically for this encounter. Looks like a great game to try out while waiting for other members of the club to arrive. Shadow Wars – No rules content this month, but a nice featurette on what went into the inspiration and creation of several Kill Teams from GW staff. 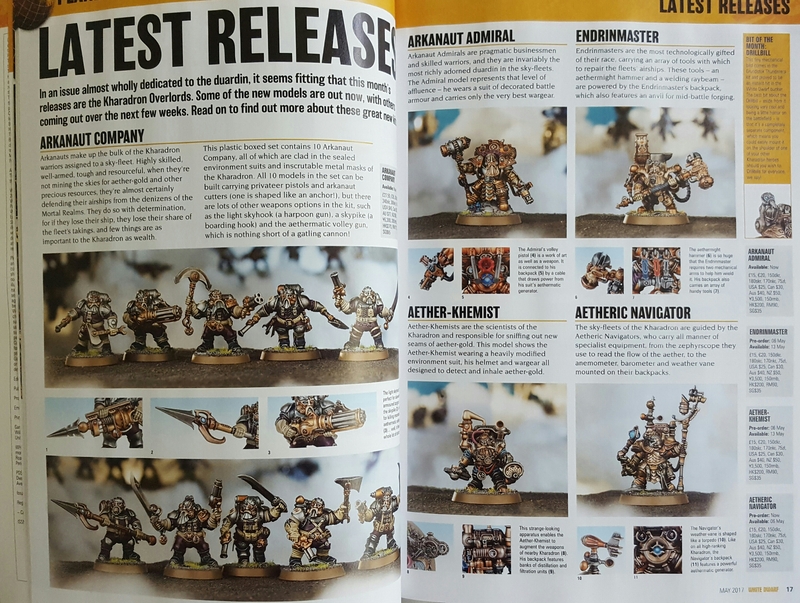 They all look great, but the standout for me was the converted Skitarii Kill Team by Duncan Rhodes. Warhammer Quest – Two bits for those of us adventuring in the new Age of Sigmar. 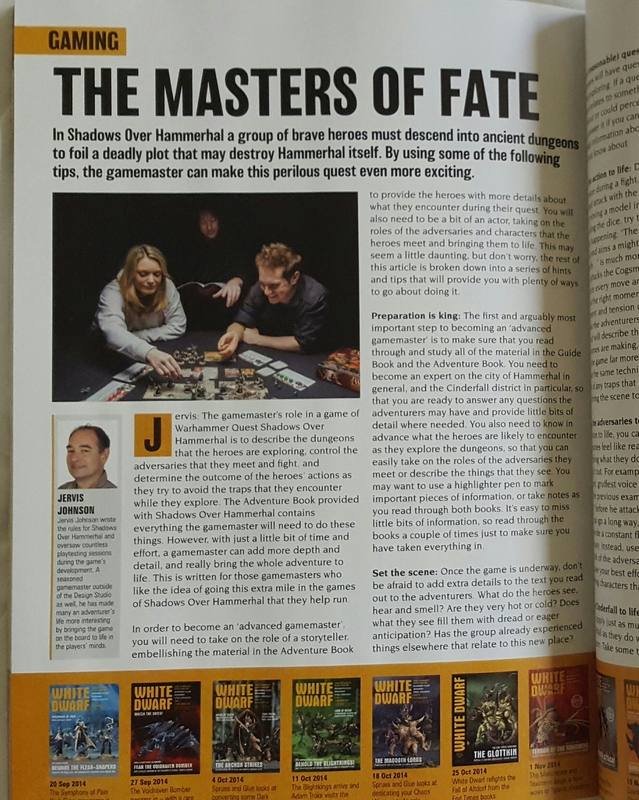 First up are words of advice from Jervis Johnson on how to enhance the mood of your Warhammer Quest games. Standard, solid advice, but I had to get a chuckle out of the all black wearing GM floating around the background of the article’s picture. He reminds me too much of the black turtleneck wearing DM from TSR’s DragonStrike video and the sort of campy gaming photo we don’t see too much of anymore. Feeling brave, indeed. After this we’re given four new Kharadron heroes for Warhammer Quest. Seems the sky dwarves are ready to go underground for riches now. The heroes selected are the four new, individually sold clam pack heroes (on the right in the image below). I can see why they were selected, being able to be purchased individually, but I was slightly disappointed in the choice. These characters seem to have titles that have their responsibilities a bit above getting down in the muck of the sewers of Hammerhal. Besides, of this new line of models, I’m a big fan of the Arkanauts (on the left) with their anchors, harpoons, cutlasses, and pistols. 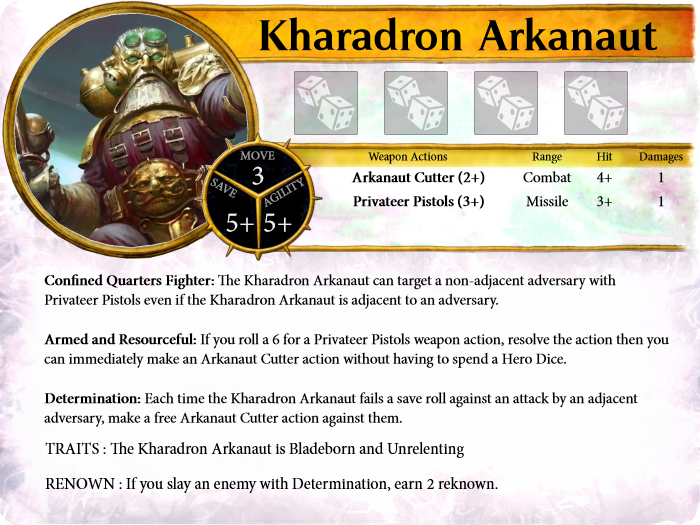 So, as a bonus for readers, I’ve cobbled together an Arkanaut hero to use in your new games of Warhammer Quest. I hope I’ve captured their resilient, scrappy nature. All in all, this wasn’t a bad issue for the Specialist Gamer. 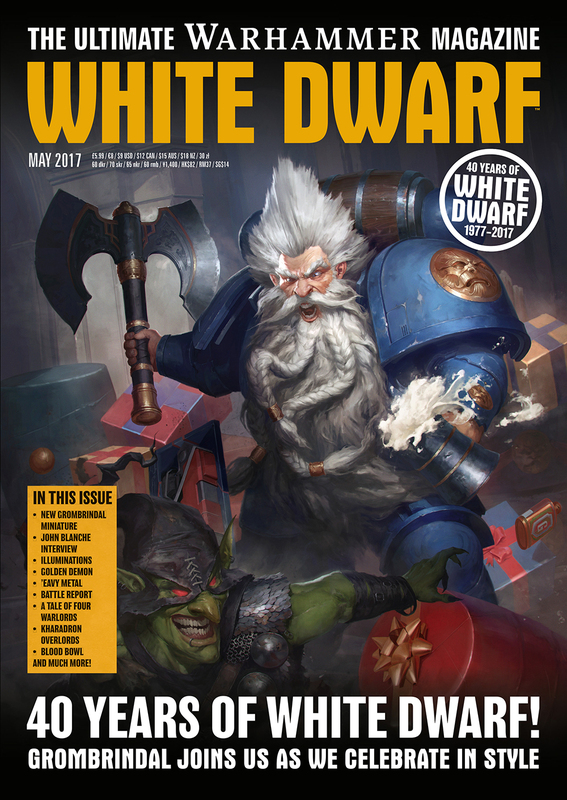 It doesn’t hold a candle to last September’s classic issue, but White Dwarf has continued to give support to Games Workshop’s tier two titles and for that I continue to look forward to each issue. I was a little surprised there wasn’t a free Grombrindal fig, not disappointed, just surprised. I’m sure he’ll have a new look in 5 years. Maybe then. 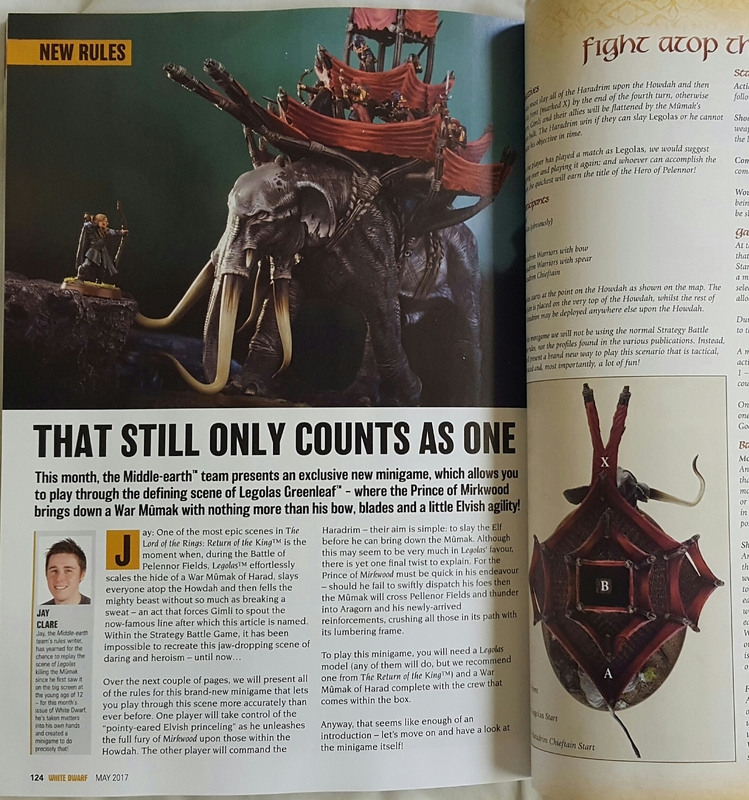 The standout for me was the Blood Bowl strategy tips article as probably the most helpful bit and what I’ll hand my son to read before we play our first match. With the new edition of 40k launching this summer, I’m expecting the Specialist Game coverage to get dialed back quite a bit. 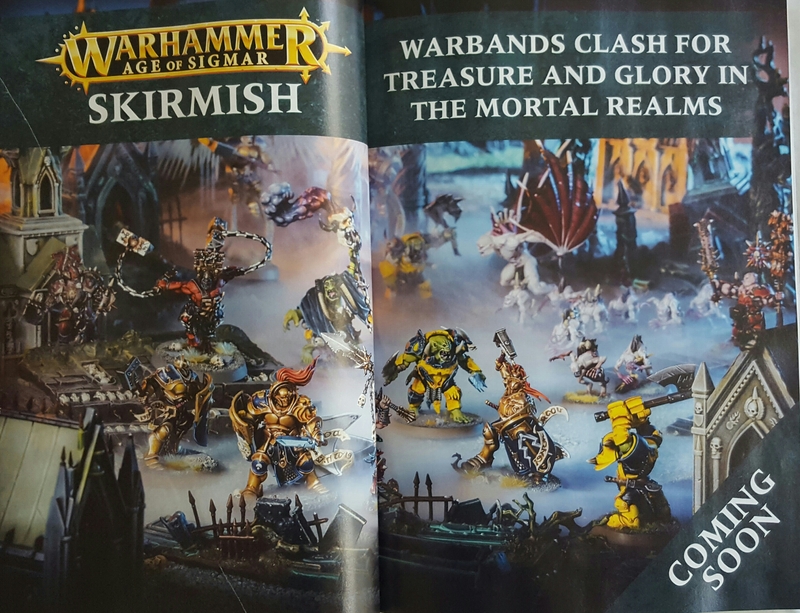 However, there was one teaser in this issue that may not be Specialist Games directly, but those of us that enjoy skirmish games such as Mordheim or Necromunda should note. This entry was posted in Blood Bowl, Gaming, Shadow War: Armageddon, Warhammer Quest and tagged Blood Bowl, Games Workshop, gaming, Miniatures, Silver Tower, table-top games, tabletop wargames, The Lord of the Rings Strategy Battle Game, wargames, Wargaming, Warhammer Quest, White Dwarf by Mr. White. Bookmark the permalink. What do you mean by ‘plays’? Scenarios of the sort that were included in the new game? There wasn’t anything like that in this issue. Maybe next!